Please welcome author Marina Myles to Enchantress of Books!! 1. This is my first short story ever! My agent and I decided to pitch the idea of a novella that would release in between SNOW WHITE AND THE VAMPIRE and SLEEPING BEAUTY AND THE DEMON (coming August 7). My editor liked the idea and off I went. For an author that only wrote novel-length books up ’til that point, it was a challenge! Fortunately, I got good advice: a fellow writer told me to plunge right into action on the first page. Hence, my heroine becomes cursed in the first chapter. 2. I patterned my heroine, Giselle, after all the beautiful opera singers I've seen perform. My husband and I are quite the opera buffs and my eldest daughter is a classically singer, so I thought the glamour of the opera would provide the perfect backdrop to this magical story. 3. While I was writing A WARLOCK’S DANCE, I came across so many odd definitions of a warlock. From evil demons to half-animal versions, I was getting a little dismayed. Could I actually create a handsome, semi-normal warlock? My warlock, Lucian Ivanu is disarmingly charming, adverse to using magic, and a bit rusty at using his dark powers. I hope you like the definition I've gone with! 4. This is my favorite cover yet!! I've gotten phenomenal feedback on it because I think people like the idea that the model’s face is hidden. (or that his head is chopped off, as one reader put it!). It leaves a lot to the imagination. Another reason I think people love it is the model’s incredible abs! 5. I've set A WARLOCK’S DANCE in Romania since it’s one country I've always wanted to visit. I love the idea of dark castles, winding country roads, and the possibility of Gypsy magic. I really hope I get to visit Romania someday. Seeing it in person would definitely give me inspiration for more books! Thanks again for hanging out with us today Marina! It was lovely to meet you and getting to know you and your book better!! Hope you'll stop by again soon!! Thank you for hosting me!! 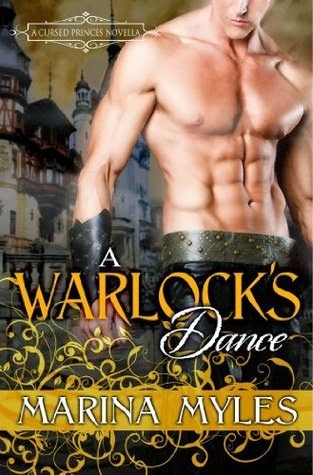 Find out more about "A Warlock's Dance" below and enter the giveaway!